Card Text: Jan Verelst, "Ho Nee Yeath Taw No Row, King of Generethgarich," a pro-English Mohawk and diplomat, 1710. 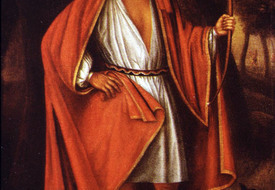 He was one of four Native American envoys sent to London to request Britain's recognition of the Iroquois Confederation as a sovereign nation, and for military aid against the French. Oil on canvas. Citation: Copyright © Library and Archives Canada, 395 Wellington St, Ottawa, ON K1A 0N4 CANADA. Gift of Queen Elizabeth II, 1977. All rights reserved. 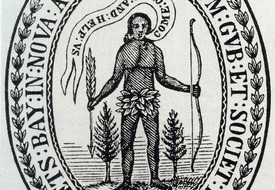 Card Text: Massachusetts Seal: In 1629, King Charles I granted a charter to the Massachusetts Bay Colony, which included the authority to make and use a seal. 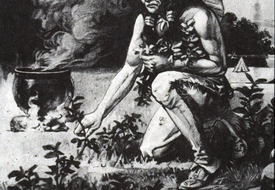 It featured an Indian holding an arrow pointed down in a gesture of peace, and the unlikely words "Come over and help us," emphasizing the missionary and commercial intentions of the original colonists. Citation: Image and text: Secretary of the Commonwealth, One Ashburton Pl, Rm 1611, Boston, MA 02108-1512. 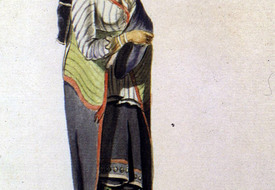 Card Text: A Mohawk woman and her baby in a board, 18th c. She is using a tumpline across her forehead to help carry the baby. French watercolor. Citation: Copyright holder unknown. In Eds. of Time-Life Books, "Realm of the Iroquois" (Time-Life Books, Time Warner Inc., One Time Warner Center, New York, NY 10019-8016) 1993. Gianni Dagli Orti. 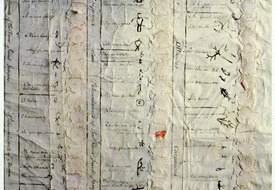 Card Text: Forced to sign away their rights to the Ohio Valley in the Treaty of Greenville, 1795, Native Americans made their marks beside the English spelling of their names. Citation: US National Archives and Records Administration, 8601 Adelphi Rd, College Park, MD 20740-6001. 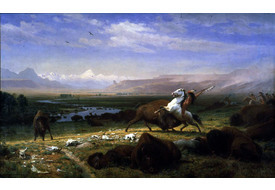 Card Text: Albert Bierstadt, "The Last of the Buffalo," 1888, oil on canvas, 71-1/8" x 118-3/4"
Citation: In the Collection of the Corcoran Gallery of Art, 500 - 17th St NW, Washington, DC 20006. Accession Number 09.12. Gift of Mary (Mrs. Albert) Bierstadt). All rights reserved. Our thanks to The Corcoran. Citation: Copyright holder unknown. 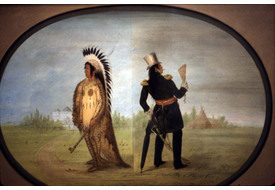 The Panorama Color Slide Co.
Card Text: George Catlin, "Wi-jún-jon, The Pigeon's Egg Head (The Light), Assineboine Chief, Going To and Returning From Washington, D.C.," 1837-39, oil on canvas, 29 x 24 in. 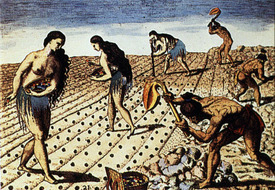 (73.6 x 60.9 cm). 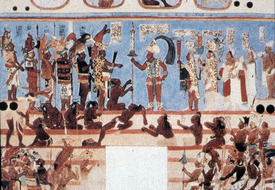 Citation: Smithsonian American Art Museum, MRC 970, PO Box 37012, Washington, DC 20013-7012. Gift of Mrs. Joseph Harrison, Jr. 1985.66.474. www.si.edu. 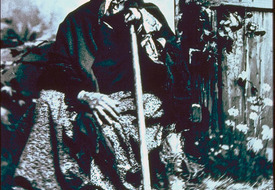 Card Text: A second image of "the Indian," depicting Indians' real condition at the turn of the century, more accurately reflected by an old woman, Princess Angelina, daughter of Chief Seattle, 1890. She was living in a hovel in the domain her people had owned and her father had ruled. Citation: Copyright holder unknown. Possibly Delaware North Companies, 40 Fountain Plaza, Buffalo, NY 14202. In Oliver O. Jensen, American Album, 1968, p. 103. 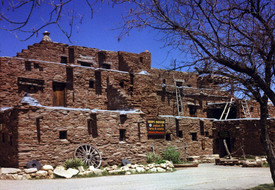 Card Text: "Oasis in the Bad Lands" (The North American Indian; v.03). 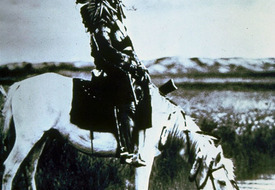 A popular image of "The Indian," Red Hawk, a Lakota Sioux warrior in all his feathers and war paint; but the photo was taken in 1905, 15 years after the last battle his tribe ever fought.